The other major items will require lifestyle changes, but these items are ones you should be implementing as you design and furnish your new home. Let us take a look at each one for a moment. Talk to your draftsman about clearly specifying dual flush toilets on your new home design and materials list. The cost of these toilets is higher but they can reduce you water use substantially. Almost 20% of all water used in a home is flushed through the toilet. A dual flush toilet allows you to do half flushes for times less water is needed. A normal toilet can use 16 litres of water on every flush; by cutting this in half you can save a tremendous amount of water each year. Another item in the bathroom which wastes water at a phenomenal rate is the shower. Standard shower heads can allow over 20 litres of water to flow out every minute. With some massage style shower heads this number goes even higher. A four-star rated shower head drops this number to only 9 litres of water per minute. These shower heads may take a little time to adjust to using, but if you desire a home which is kind to the environment and to your budget they make great sense. You have two appliances which are installed in almost every new home which you would be wise to include as part of your new house design plans. These are your dishwasher and clothes washing machine. These two appliances can waste water at a phenomenal rate, but you can make a big difference by including energy and water efficient models in your new house design. When you talk to a Drafting Concepts Pty Ltd about creating an environmental house design for you this is one topic which will be brought up. They will explore many different options with you, but will want to make it clear that these two items can make big savings. A high efficiency front loading clothes washer cuts water usage in half, it reduces soap use by over 30% and energy consumption by over 30%. The higher efficiency dishwashers are just as impressive. They use only 7 litres of water to wash your dishes which is less than you washing by hand. Their energy use is nearly 30% less than a tradition dishwasher, also. It is very common for corners to get cut on items like water faucets when your environmental house design quotes and construction estimates are being calculated. Insist on the highest quality faucets available. They resist failure and leakage for years and will save you money. Consider the fact that a slow dripping faucet can leak over 9000 litres of water per year. Those cheap faucets are not a good bargain. 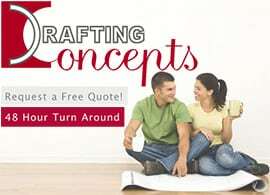 When you sit down with Drafting Concepts Pty Ltd of Brisbane to discuss ideas on how to save water let them know you are ready to invest in quality to save money in the future.